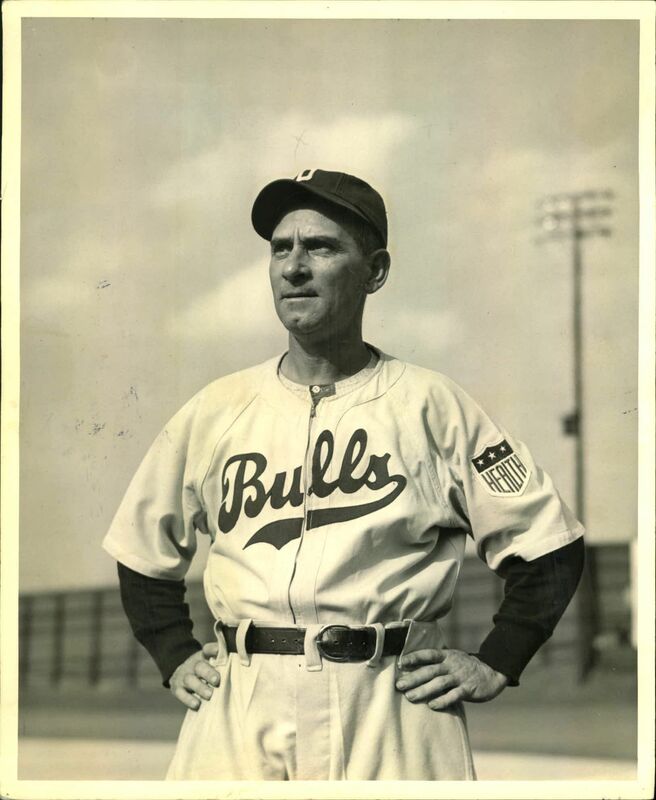 As most of you probably know, all MLB teams wore “Health” patches in 1942. This was the logo of the Hale America initiative, which was basically a “Shape Up!” fitness program that arose in response to America’s entry into World War II following the bombing of Pearl Harbor. 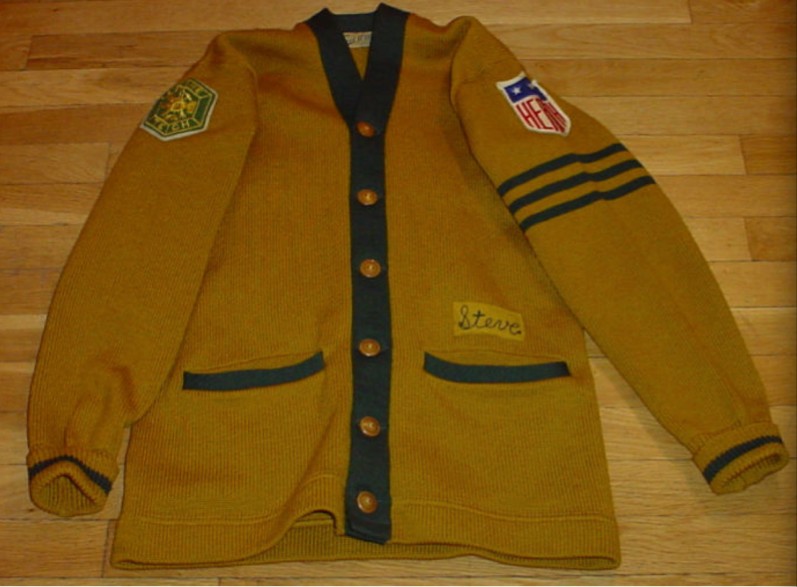 The patch was also worn by minor league teams, and I’ve occasionally seen it showing up in other places, like on this vintage Lane Tech varsity sweater. “Hale America,” designating “health,” is a program now in operation all over the nation to promote national physical well-being. • The first patch, as you can see, is for umpires. Specifically, it’s for softball umpires — the “A.S.A.” stands for Amateur Softball Association, an organization that was founded in 1933 and still exists today. The puzzling thing is the “International Federation” designation at the top of the patch, which seems odd because (a) the A.S.A. was, and still is, an American organization, and (b) the Hale America program was, obviously, an American initiative. Hmmmmm. • The middle patch is for a softball team. I’m wondering why they wore this patch, instead of the plain “Health” shield. • The patch on the right is for bowling! As you can see, this one actually includes the words “Hale America” — first time I’ve seen that. Also, the slogan “Bowl & Keep Fit” combined with the “Health” design feels very familiar to me, because “Bowl for Health” was a common mid-century ad slogan. Did that slogan get its start with the Hale America Program? These patches are a bit more straightforward. The first two are the standard “Health” design that was worn by MLB and MiLB players in 1942. Ah, but the third one — “Fitness”! Just like I always thought, it looks and feels better than “Health.” I wish they’d used this as the primary design. • At first glance, the patch on the left looks like the standard “Health” design. But it only has two stars, instead of three — sort of a lower-grade version. I wonder if there was a specific protocol that called for this patch to be used, instead of the three-star version, in certain situations. • Next up is the strangest patch of the bunch. “Pants”?! What could that be about? • The last patch was grouped with all the others in the eBay auction, but I’m not convinced this one had anything to do with the Hale America program. Does anyone know what “WIPS” might have stood for? 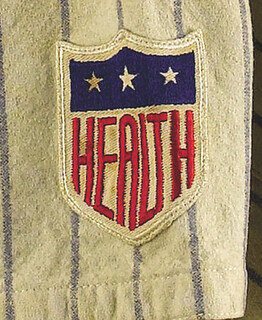 In 1943, the “Health” patch was discontinued and replaced by a stars and stripes shield. It’s not clear to me if this was because (a) the Hale America program stopped using the “Health” design; (b) the Hale America program was scrapped altogether; or (c) MLB decided to use a patch that wasn’t connected to Hale America. Anyone know more? I know lots of you would rather talk about which helmet Virghio Tech State is wearing this weekend and don’t really care about old patches, but I’m actually super-excited about today’s post. And you should have seen how geeked out I was when those patches showed up in the mail. So cool! Now I just have to figure out what to do with them. ’Skins Watch: Rick Reilly has responded to the response to his pro-’Skins column. Only now he’s saying it wasn’t really a pro-’Skins column. Not only that, but he thinks the name will be changed. Some interesting (if confounding) stuff here — worth reading. ”¦ Some of you have complained that I don’t give equal time to pro-’Skins articles. The fact of the matter is that I link to anything related to the naming controversy, pro or con. Those of you who support the retention of the team’s name, however, might want to ask yourselves if articles like this one do more harm than good for your side of the debate. ”¦ “Last question during the Wednesday night’s Virginia gubernatorial debate was whether the ’Skins should change their name,” reports Sam Sharp. “Both candidates agreed that a governor shouldn’t tell a private business how to operate.” Real profiles in courage right there, eh? Further details here. 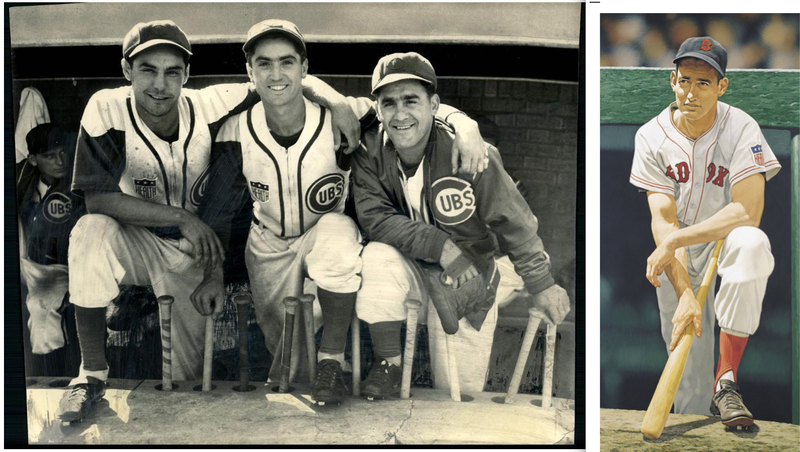 Baseball News: When I was on Keith Olbermann’s show two nights ago, KO’s opening monologue mentioned how the 1963 A’s mostly wore either their first names or nicknames on their backs. Turns out they had to keep the names short, because the A’s vest jerseys didn’t offer much real estate to work with (awesome find by Todd Radom). ”¦ The Yankees are still wearing those Mariano Rivera patches on their sleeves and caps. To reiterate: I think showcasing an active player in this manner is unseemly. I realize some of you disagreed with me on that point, at least in terms of the Yanks wearing the patches last Sunday, when they gave Rivera a big send-off. But tell me this: Are you still okay with the patches being worn for all these additional games? 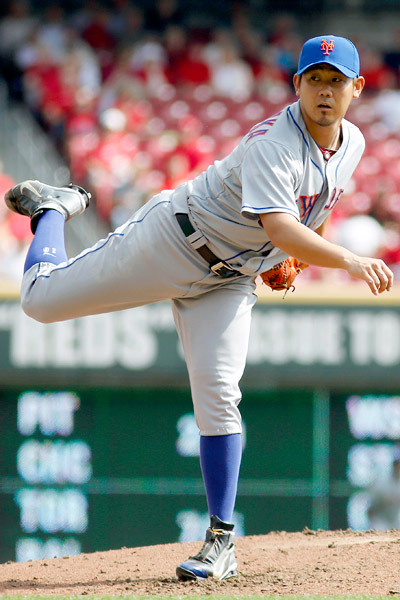 ”¦ Daisuke Matsuzaka once again wore those socks emblazoned with a swoosh and his uni number yesterday — grrrrrr. Also, as you can see there, he’s been wearing zip-up shoes. 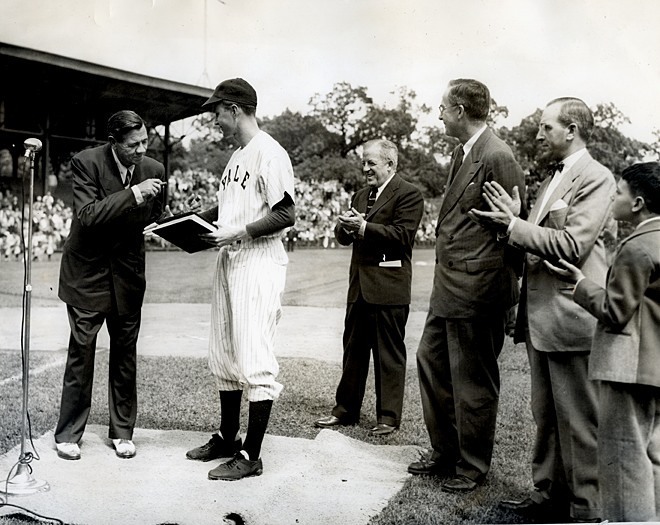 ”¦ Hey, remember the plan to replace (or at least supplement) dugout phones with cell phones? I don’t know about you, but I haven’t seen a manager or pitching coach calling on a cell phone all season. Was the plan scrapped..? 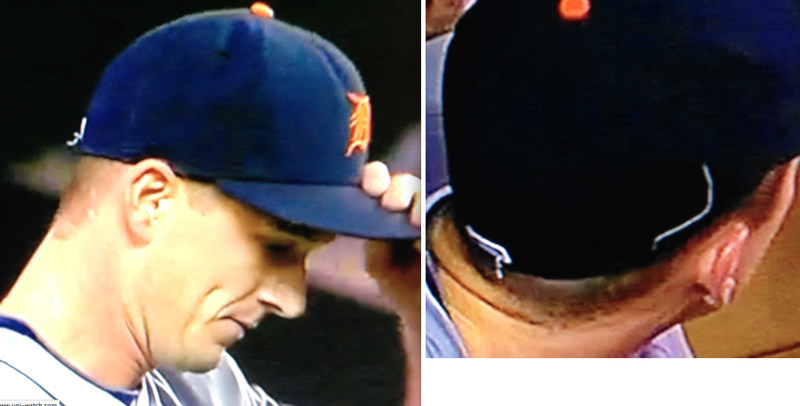 ”¦ Awesome work by Jarrod Wheeler, who noticed that Tigers pitcher Drew Smyly had a loose thread hanging from the MLB logo on the back of his cap last night. NFL News: The Rams will wear solid white at home for tonight’s game against the 49ers (thanks, Phil). 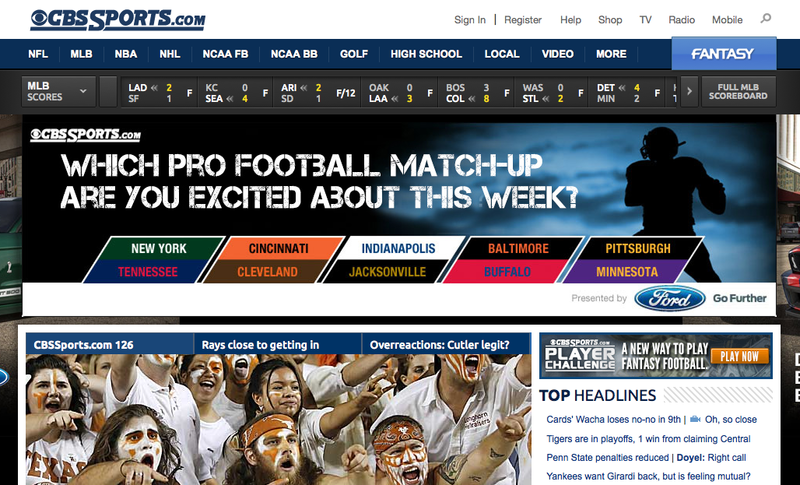 ”¦ “The CBSSports home page usually has a large ad at the top of the screen,” says Bill Schaefer. “Wednesday’s ad, brought to us by Ford, showed a series of NFL match-ups, with teams’ city names shown in their NFL team colors — except for Baltimore, which was displayed in orange and black. An Orioles fan must have made the ad.” … My recent ESPN column about former NFL logo designer Stevens Wright, who among other things designed the 49ers’ infamous one-day helmet logo, prompted this note from Mike (who didn’t give his last name): “In 1991, when i was working at a start-up NFL trading card company called Action Packed, the 49ers sent me a T-shirt with that logo. I wore it for about five years then tossed it.” D’oh! ”¦ Several times over the years I’ve mentioned how the Chargers used an unusual FIOB style from the 1970s, with the initial coming after the surname. This was also done by the Browns. 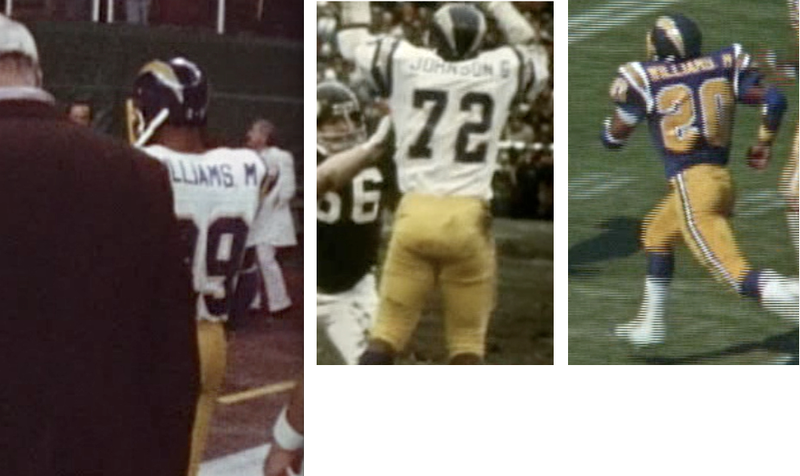 You can see video of Chargers defensive lineman Deacon Jones wearing this style here (from Bill Shannon). Hockey News: Brian McGrattan of the Flames is singing the praises of Kevlar socks. “Apparently the socks prevented an injury similar to Erik Karlsson’s from last year, when Matt Cooke’s skate blade severed his Achilles tendon and he missed significant time,” says Sam Belk. “I wouldn’t be surprised if this is made mandatory and/or players adopted it immediately.” … EC Red Bulls Munich — that’s a Red Bull-owned German hockey team — has a pretty wild Oktoberfest uniform. Look at the knit pattern on those socks! (Big thanks to Stefan Schubert.) ”¦ Here’s a slideshow showing the evolution of Team Canada uniforms over the years (thanks, Phil). Soccer News: Can’t stop your opponent? Pull down his pants. That’s Tottenham’s Jan Vertonghen trying an unusual defense against Aston Villa’s Nicklas Helenius on Tuesday (from Eddie Lee). ”¦ A British TV show wanted to use official Arsenal merch in one of its episodes, but Arsenal refused to grant them permission because the show depicted Arsenal fans as half-witted criminals. “So instead the show depicted Arsenal fans as half-witted criminals wearing unbranded gear with club and sponsor logos covered up,” reports Yusuke Toyoda. NBA/WNBA News: A video game leak suggests that the Clippers will have a sleeved alternate jersey this season. Someone has suggested that the look a lot like old Louisiana Tech women’s hoops uniforms, which I’m sure is precisely the comparison the Clippers were hoping for. ”¦ Key passage in this story about NBA commish-to-be Adam Silver (aka the guy who hates my guts for “giving out” his email address, even though it was publicly available for anyone who Googled his name): “[Silver] hasn’t abandoned the idea of selling advertisements for the front of the jerseys. ‘It’s something we’re still considering. It’s on the backburner right now. '” This continues a run of fairly non-aggressive statements by Silver on the subject of uniform ads. As I wrote two weeks ago, it’s not clear whether this more reserved approach is (a) Silver’s way of striking a respectful tone of moderation until David Stern (who opposes jersey ads) officially retires in February; (b) a stealth approach, so as not to provoke the kind of grass-roots outrage that galvanized when Silver first raised the prospect of uniform ads; or (c) a legitimate expression of where things truly stand at the moment. I’ll start taking Silver’s statements more seriously when he’s officially replaced Stern and will presumably be freer to speak his mind. ”¦ That same article also includes this: “Nets CEO Brett Yormark agreed to have the Nets participate in two uniform gimmicks this season — one game where they have nicknames on the back of the jerseys, another where they wear short-sleeved uniforms.” We already knew about both of those, of course, but it’s always good to see uniform coverage in a mainstream newspaper (my thanks to Phil for pointing out those passages). ”¦ Last year I did a big ESPN column on players who’ve worn zero or double-zero. But my list did not include James Worthy of the Lakers, who wore 00 on Dec. 11, 1987. BasketballReference.com, which is generally pretty trustworthy, shows Worthy wearing No. 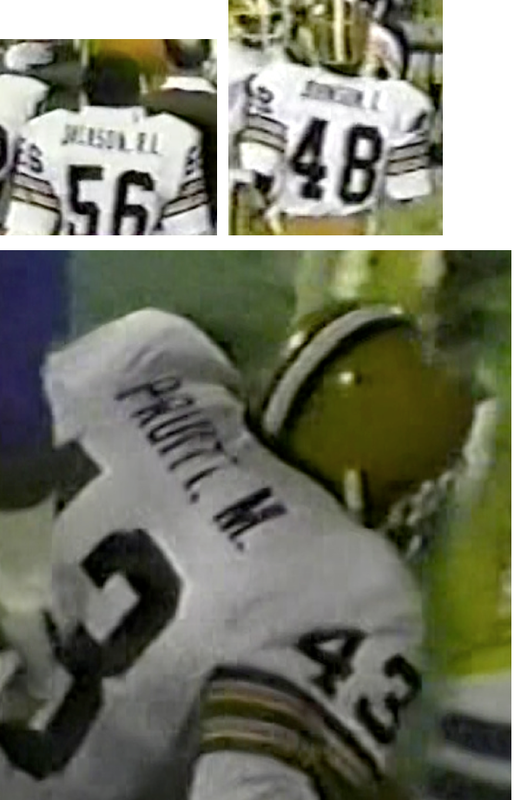 42 for his entire career, so I told Roman Sprikut, who found that photo, that it was probably a blood jersey. Sure enough, Roman then found a rear-view shot showing that Worthy’s 00 jersey was NNOB. Definitely a blood jersey. 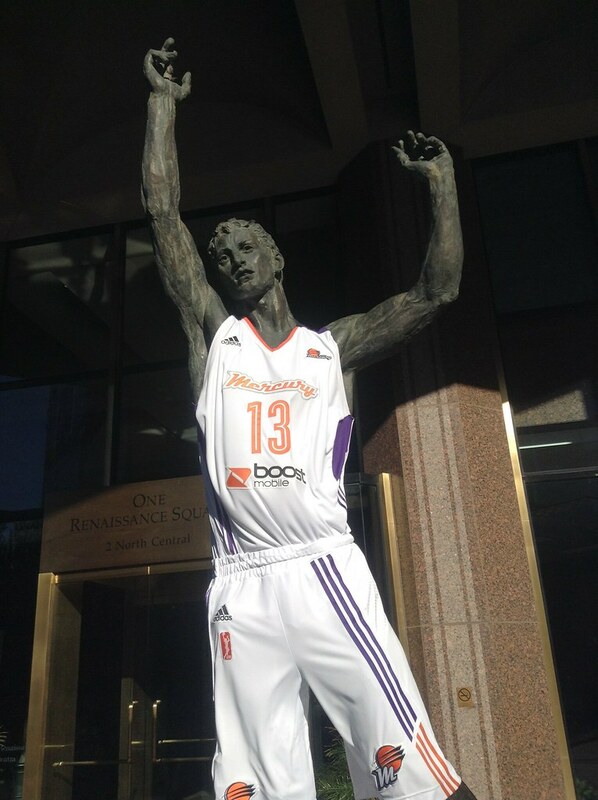 ”¦ With the WNBA playoffs underway, the Phoenix sculpture known as Full Life Reach is wearing a Phoenix Mercury uniform (rare non-soccer submission from Kenn Tomasch). College Hoops News: New sweatbacks for Clemson (from Austin Pendergist). … New uniforms for Iowa State and Kansas, too. You can see larger images of the Kansas uni here and here (from Phil and Seth Wiley). Grab Bag: If you think pee-wee football players aren’t big, strong, or fast enough to deliver or suffer significant head impacts, think again. If you have a kid who plays football, you’ll want to read that. ”¦ Some missing cricket uniforms have shown up on eBay (from Leo Strawn Jr.). … Good article on Google’s use of design (thanks, Brinke). … Why wait until March Madness to create bracket-style setups? My man Hamilton Nolan has whipped up a really great privilege bracket. Great stuff. … Michael Ostrofsky claims that his parents’ cat, Mr. Nuts, “has correctly picked the outcomes of Super Bowls, presidential elections, and the gender of the Duke and Duchess of Cambridge’s kid by taking a dump in one of two carefully prepared litter trays.” Now Mr. Nuts has weighed in on the outcome of the America’s Cup. … Good history of uni numbers on rugby jerseys, which apparently dates back to 1897 (from Caleb Borchers). I think you’re missing a “don’t” in the first ticker item under Grab Bag. Or an “n’t” on the end of are. “Aren’t” instead of “are,” methinks. Last night Todd Helton played his last home game for the Rockies. No uniform modification, but this in front of the dugout, the same trope on the pitchers mound and cut into the centerfield grass. Also special first base markers. The “pants” patch is outstanding! Would look great on a letterman jacket. It would look best on a David Letterman letterman jacket.
. . . or a jacket worn by the actor who portrayed this fellow. Perhaps the “pants” patch was part of a campaign to encourage women to wear pants instead of skirts so as to facilitate exercise and war work. Not nearly as funny as some other options like “show Hitler who wears the pants in this world”. . . if above is right, then perhaps “WIPS” is “Women In Pants Service” or some such. Good one! The “Hale America – Bowl & Keep Fit” badge on the front of the program is similar to — but not an exact match of — the bowling patch shown in today’s entry. Those Health patches bear a striking resemblance to the NFL shield. 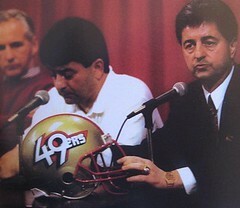 By any chance did the NFL use those patches as an inspiration when they came up with their logo? So no, the NFL logo isn’t based on the Hale America patch. Rather, the NFL logo and the Hale America patch (and lots of other things, like Interstate highway route markers) are based on once-common design trope of a stars/stripe shield. Surely that older, more universally recognized and known symbol was the NFL’s inspiration? But it would be amazing if it were to turn out that the Health patch played a role in inspiring the NFL’s logo. They actually bear a closer resemblance to the All-American Girls Professional Baseball League patch. Of course, the AAGPBL was founded in 1943, one year after these Hale patches were produced. Paul, you won all 9 of those in one auction? HOLY COW! That’s a S.T.E.A.L! I’m envious, big time! Congrats. In regards to the dugout cellphones, I toured Wrigley Field a couple weeks back (http://www.flickr.com/photos/walaitis/sets/72157635601810835/), and I specifically looked for the pink-branded cell phones, and I could find none. I really should have asked our tour guide about them! The ASA is wholly American in its founding, but it has significance influence outside American borders. We, for instance, use ASA bat testing rules to determine the legality of bats in our province. We also have a number of rules adopted from the ASA upon which our growing rulebook is based. While the ASA is certainly still an American organization, it certainly reaches outside its originating country’s borders as well. Paul, I suspect the Good folks in Oklahoma City, can help you with any questions about the patches. ASA and the ISF – International Softball Federation are pretty much intertwined with each other. And just about every other softball organization in the country (USSSA, PONY, etc) follows ASA’s lead in rule changes. mechanics, standards, etc. When the draft was reinstated in 1940, both of these issues would have regained currency. In WWI, it wasn’t that Midwestern boys weren’t physically fit – it was still an agrarian region, and as in the Civil War era, Midwesterners were the most muscularly robust people in the nation. It was about health – systematic malnutrition had rendered many of the brawniest young men in America unfit for military service. And the 22-year gap between the end of WWI and the restart of conscription meant that it was the WWI generation that was running the country when WWII came around. So it’s understandable that “health”, writ large, rather than the narrower “fitness,” would have been the slogan of the Hale America campaign. If anything, the problem is much worse today: By some accounts, more than two-thirds of military-age Americans are now unfit for military service, though today it’s not due to lack of vital nutrients but to obesity. We could use athletes wearing Health patches today! Pearl Harbor may not have been bombed until December 1941, but the European war began in 1939 and U.S. military preparation for war had been a dominant domestic political issue since at least 1938. But read the article you link to more closely. (Great find, by the way!) It’s plainly, and overtly, all about military readiness. “[Europe] will force us to our knees if we ever come to grips” is not a metaphor for economic competitiveness in this context. When someone refers to the European Theater of WWII, during WWII, and talks about who’s going to win a fight, he’s actually talking about fighting. Even the emphasis on being a voluntary program, rather than a government mandate, is revealing, coming as it does just weeks after the end of the highly contentious national debate that led to instituting the first-ever peacetime draft. Note the date of the article: October 10, just six days before the draft began. And I can’t take credit for finding the article — it was forwarded to me by Hall of Fame curator Tom Shieber. I’ll be posting more stuff from him (with proper attribtion, natch) in a follow-up item tomorrow. This is great stuff, guys. Can’t wait to see what you have tomorrow, Paul. Could “Health” be intended as a counter to the notion of Aryan superiority? “Health” means more than physical fitness. It means wholeness,of mind, body and spirit. It means cutting loose stilted traditions, (like the idea that respectable women don’t wear pants, even when they’re working heavy machinery and wearing a dress is life-threatening) to embrace new and vibrant ideas. It’s a way of expressing a strength of character that transcends bloodlines. “Health” also hearkens back to the Christian notion (which itself has roots in pre-Christian teachings from Greek and Egypt) that the body is a temple. World War Two was the last war we fought where nearly every American perceived us as the good guys, fighting Evil, and where nearly every household felt personally involved in the war effort. This was a holy war, and it required soldiers sound of mind, body and spirit, “healthy” fighters. In this sense, these patches are sort of like the updated Captain America: they’re sort of kitschy and dated, but admirable and cool at the same time. And they make us feel a little wistful, a little sorry for our cynicism and world-weariness. 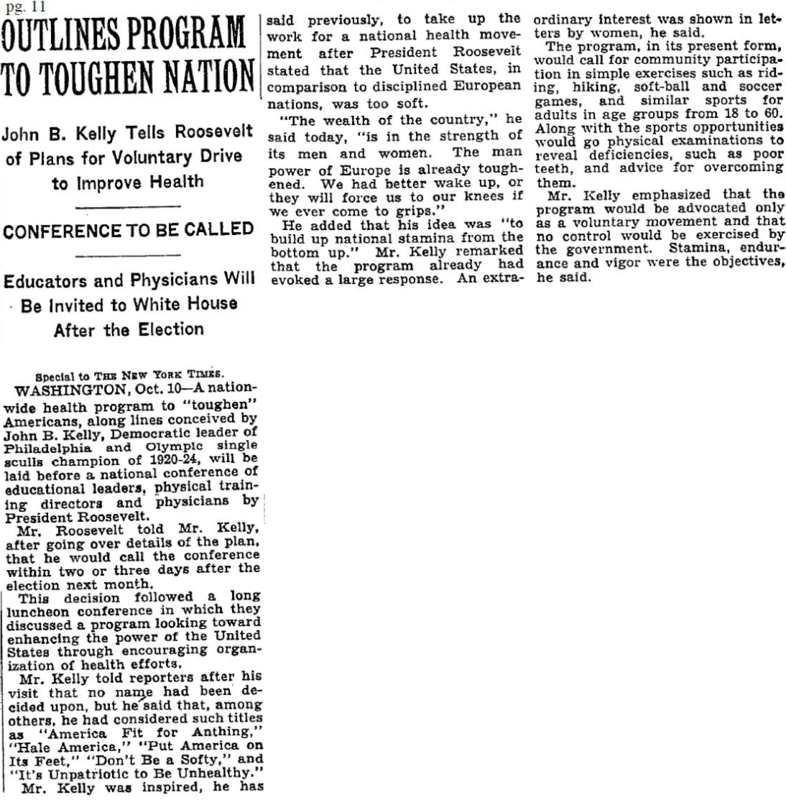 That broader notion of “health” also fits nicely with the “muscular Christianity” which was at the time the dominant popular theology of Protestant Americans – occupying roughly the same cultural and theological role as therapeutic Evangelicalism today – and whose language John B. Kelly uses throughout the article linked above. Though Kelly was probably Catholic, so that was likely more a matter of muscular Christianity’s broad influence on the majority culture of the day rather than any individual attachment to the tenets of American Methodism or Episcopalianism. Muscular Christianity persists to this day, especially among southern US evangelicals. That would actually make an interesting post: depictions of Jesus through the years. (Not for this site, but somewhere.) Depending on the denomination and the prevailing winds of current events, Jesus can look like anything from an effete art student, to a Viking, from the Brawny paper towel guy to the lead guitarist in Supertramp. Paul, seriously, these patches could open into a very rich cultural study of America in the war years. There’s a lot there. Considering Muscular Christianity is the basis for sports as we know it, especially scholastic sports, it makes sense that the Deep South is the hotbed of college sports (not to mention prayers before football games and NASCAR events). True that, though it’s easy to conflate the theological notion of muscular Christianity, which was a British import via Methodism, Episcopalianism, and low-church Presbyterianism, with the parallel American vision of a manly-man Jesus. Two different things, really. Modern Evangelicalism is, theologically, largely a reaction against Mainline muscular Christianity, or at least was in its formative decades prior to embracing political activism in the late 1970s. Therapeutic Evangelicalism is rooted in pietism, not activism, though the movement’s eventual embrace of in-the-world political activism could be seen as the triumph of the cultural content of postmillennialist muscular Christianity over the theological content of premillennialist Evangelicalism. tl;dr – Watch “Chariots of Fire.” It’s all there. Hence your Viking Jesus versus your Roger Hodgson Jesus. The thing about the Arsenal jersey thing is that the show still mentioned “Arsenal” and “Emirates” multiple times, and the unbranded red jersey with the white sleeves are unmistakably Arsenal’s. Seems there wasn’t much point to say “no” to the TV show, except to save face with supporters and sponsors. That’s probably enough for them. Can’t really stop the tv show from using those two words, though. The (TV) detectives, led by Warren Brown and Shelley Conn, trick a half-witted Arsenal fan, who has skipped bail on robbery charges, by inviting him to attend an exclusive tour of the Emirates stadium. Damn, you got those patches for only 2 bucks? Steal of a lifetime! And fascinating stuff. I know! $2 for all that beauty and mystery. I think one of them should be custom sewn onto a logoless, vinyage-type ballcap, no? Favorite post in a long time, Paul. As you may remember, I used the Health patch on the Dubois County Bombers uniforms the last two years. I always get asked about it, and now I’ll have a link I can refer them to. Awesome to see the actual patches and such a variety. My main exposure has been through photos and reproductions. Cool to see the variation and how widespread the program was. I like the patch entry. I wonder if the “pants” patch was worn on pants or a shirt. Any thought about using those dugout cell phone stations had to be off the table after David Ortiz’s freak out earlier this season. Are you still okay with the patches being worn for all these additional games? Paul, one other Hale America tidbit that may interest you. In 1942, they sponsored the Hale America National Open golf tournament. The USGA partnered with the PGA of America (no separate PGA Tour at that time) to run the event in place of the US Open, which the USGA felt was inappropriate to conduct with the USA involved in WW 2. Ben Hogan won it. The interesting thing about it is that he was awarded a gold medal identical to the one the USGA gives the US Open champion. The significance of the story is that it would be Hogan’s 5th US Open title, which would be a record. The USGA does not recognize it as such, even though it was run in the same manner as the US Open (using local/sectional qualifying sites). Hogan always did and fought until his death to have it declared a 5th US Open title. Many golf historians agree with him. Send the “pants” patch to Worldwide Pants, Inc., a.k.a David Letterman’s production company. Mr Nuts got it right! I don’t know, do countries even matter in America’s Cup, considering the competitors are mostly from New Zealand? There’s nothing USA about Team Oracle other than that Larry Ellison is a very rich man from America. The ads on the boats were only marginally more prominent this year than 3 years ago. But the crew uniforms were a bigger deal, I assume because of vastly increased safety issues inherent in the sport becoming something closer to daredevil aviation than traditional sailing. Crew accounts of crossing the netting between catamaran hulls while flying 12 feet above the ocean with water spraying into their faces at 50mph have been pretty harrowing. Makes sense that they’re outfitted more like NASCAR drivers, with helmets and all, than the polo shirts and shorts of yore. I don’t care what sport it is – coming back from 8-1 down to win a best of 17 9-8 is pretty impressive. Especially since USA started with a 2-point hole to dig out of due to penalties. So it took them 19 matches to win the best-of-17! I can’t say I’ve followed America’s Cup. But I am intrigued by this Mr. Nuts. Has he had the ol’ snip-snip? Because naming a neutered cat “Mr. Nuts” is either weird and kind of funny, or weird and kind of cruel. I can’t decide which. Dorothy Parker named her parakeet Onan, because he was always spilling his seed. This has nothing to do with anything, but how often do you get to share that information? Just another day at Uni Watch. Thanks, Cort. The Yanks are wearing those Mariano patches to close out the season. I’m sure I read that last week when they were unveiled. It does seem a bit strange, though, to be wearing them that long and for a player who is still on the team. Paul, as far as I know, the Yanks will be wearing those patches to close out the season, including on their away unis. Seems a bit much to wear them while away, no? It’s 1942. “Hale” sounds like “Hail”, which is the English version of the German word “Heil”. I got a chance to look at the Google cache of the graphic designer’s spec rebrand for MLS that was removed from yesterday’s ticker. On first glance, it’s not bad. It’s well thought out, with the design theme carried out across different formats. But then, it all felt very generic and very 2013, so it could be used for pretty much any sports league (or product, for that matter), and it would look very dated in about 5 years. Terrible, could you post the link to the MLS rebrand? I didn’t check in yesterday until after the link was taken down and was hoping to still get a chance to check them out. Thanks Terrible, I agree it’s a strong look but it looks very trendy and I don’t know how well it would hold up. The branding with MLS is very interesting you have a weird mix of forced/nonorganic nicknames from the early years followed by forced/nonorganic European nicknames and now finally the new teams seem to be embracing their local soccer heritage. There are really no better nicknames in the MLS than the teams in the Pacific Northwest that have embraced their NASL nicknames and Montreal who kept and tweaked their pre-MLS brand. Interesting read on the history of the Gamecock logo with a possible Easter egg hidden in it. Paul, great lede today. I’ve been researching the Hale America movement for a blog post of my own, but I’ve never seen anything like that “PANTS” patch. The former President George H.W. Bush may not wear stirrups, but he does wear fancy socks. For what it’s worth, Robinson Cano wasn’t wearing the Mariano patch last night. Maybe the only #42 he wants to pay tribute to is his namesake? The irony is tragic that for an athlete named after Jack Roosevelt Robinson, Cano is the antithesis of what Jackie Robinson was on the field, specifically with his habitual lack of hustle and intensity. I also find it interesting that when Cano’s #24 is discussed as being worn to “honor the player he was named after” it is never mentioned that Cano was very happy wearing #22 with the Yankees, and changed only to give 22 up for Roger Clemens return from retirement. When Cano arrived in 2005 Tino Martinez (the previous #24) was 3 years removed from the team and was issued 14, with the eventual switch to 22 occurring either late in ’05 or at the beginning of the ’06 season. With the Clemens return in ’07 Cano moved up to 24. Paul, I understand and respect your perspective about the Redskins’ name and agree that the article to which you linked doesn’t represent the opposing view very well. But the fact that you include the link and state that the article doesn’t help that argument very well isn’t logical, or is at least partially logical. Does this mean that every article that protests the use of the monaker is tasteful and well articulated? I’m simply saying that there will be uneducated, misinformed, ill-communicated views on both sides of the issue. That being said, you do a fine job of representing both sides of the issue. Also, while I know candidates for office can be pretty disingenuous, I believe that, regardless of party affiliation, it’s not government’s business to get in the middle of a private naming issue. Let the consumers/fans speak with what they do or do not spend to support that team. Thanks for all your great work on this site. Does this mean that every article that protests the use of the monaker is tasteful and well articulated? I think what Paul means that there’s probably a scarcity of articles that articulate the pro-‘Skins POV, and being “fair and balanced” for the sake of being fair and balanced doesn’t do either side any good. I’m assuming that Examiner.com was sent to Paul with a “Hey, why don’t you present the other side?” note. Also, the gubernatorial candidates’ responses would’ve been fine if the question was “Should the Governor of Virginia force Daniel Snyder to change the name of his team?” But it wasn’t. Chuck Todd asked, “Should they change their name, Mr. McAuliffe? Is it offensive to– it’s offensive to a lot of Native Americans. Do you think they should change their name?” They ran from the questions fast enough to impress NFL scouts. And you know what? The government does, and should, tell businesses what to do within reason, especially when said businesses rely on millions in public funding and infrastructure to operate. it’s not government’s business to get in the middle of a private naming issue. 1) Government gets involved in private business matters all the time. 2) If you read the piece I linked to, you’ll see that the debate moderator followed up with, “OK, but what about your personal opinion?” and they still punted. Regardless of which side they’re on, they should have enough spine to say so. Thanks for the props — appreciated. I kind of see two slightly different angles here. On the “it’s not the government’s business” argument, that would be a fine argument to make, if and only if one first declared one’s opposition to trademark and copyright protection. The whole Redskins name issue is only even an issue because, in the first place, the Redskins have a government-issued monopoly on the business use of their name. 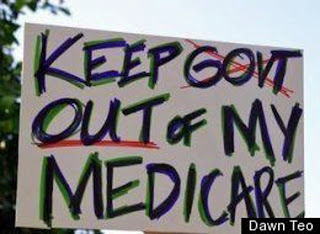 Saying the government shouldn’t be involved in a “private naming issues” in this case is exactly equivalent to the old coots waving Keep the Government Out of My Medicare! signs. As to the candidates, well. Yeah, it’s probably a profile in political cowardice, especially on McAuliffe’s part. (I say as a likely McAuliffe voter.) But it could actually be seen as an exercise in prudence for both candidates. There’s no “just my personal opinion” for a public official, and especially not for an elected executive. Any public statement of opinion or preference will necessarily be understood as a statement of policy preference. Since resources are limited, a prudent politician will keep to himself any opinion on which he does not intend to act, or lacks the means to act. Since there’s nothing the governor of Virginia can do about the Redskins name, and since both men quite likely agree that there is nothing the governor of Virginia should do about the name, prudence, not merely electoral cowardice, would argue against declaring one’s opinion on the matter. I guess there’s a hopeless romantic in me who wished McAuliffe had said something more nuanced that called for dialog while defending the right of private business, blah blah blah. It wasn’t too long ago when members of congress sent Goodell a letter regarding the Washington name, and that wasn’t the first time members of government have taken a stance on such things. Not by a long shot. The politicians in question (asked in the debate) answered like politicians do. That’s to say in a cowardly manner. The pro Skins name column is notable because the author references an Ad Age survey for the proposition that most Americans and Native Americans are in favor of the name as-is. Typical of Ad Age. Likewise, the Petroleum Institue has just released a study saying most Americans love the sight of a tar ball on the beach. Anyone else bothered by the non-pointed corners of the “Pants” patch? That one detail differing from the others gives me probably too much pause about that patch being a 1942 artifact. I would love for that one to be an artifact of David Letterman’s media empire. Among his yearly staff holiday gifts have been vintage-style baseball jerseys made by M&N – ebay being the best source for photos – but alas I find no evidence that any Worldwide Pants jerseys have had a Health-inspired Pants patch. My second-favorite bizarre origin would be women in the AAGPBL making a Health-style Pants jersey in protest against having to play baseball in skirts. Also, the side-by-side arrangement is just one of the best images in the history of the internet. Health Pants! Presumably related to a href=”http://www.youtube.com/watch?v=0iRTB-FTMdk”>Fighting Trousers. Plus the cliffhanger formulation of Health Pants WIPS … I’m dying here. Health Pants whip what? Unemployment? Hitler? Polio? Also, the side-by-side arrangement is just one of the best images in the history of the internet. Health Pants! Presumably related to Fighting Trousers. Plus the cliffhanger formulation of Health Pants WIPS … I’m dying here. Health Pants whip what? Unemployment? Hitler? Polio? The background behind the “Health” patches reminds me somewhat of the Presidential Physical Fitness Test Awards that we had to do back in elementary school. Looks like they are still doing them. On something more related to the Washington football team naming controversy, here’s the Wikipedia article on Chief Wahoo. I remember reading it about a year ago, and it was a rather short article, but I stumbled upon it the other day and it is now a well-sourced (it has over 300 sources), thoughtful piece that has both sides of that debate. Judging by the history, someone by the name of Anotherpioneer started working on the article back in May and greatly expanded it. (This is what the article looked like just before Anotherpioneer got involved.) As recent as two weeks ago, Anotherpioneer was adding information to it. He/she clearly has an interest in Native American mascots, wonder what Anotherpioneer’s thoughts are on the Washington football team’s name. Kurt Busch was rumored to be driving a double zero Chevy full-time when he signed on with Stewart-Haas Racing for next season. I don’t know if NASCAR refused to let SHR secure the 00, if Busch wanted some other # or if the team had second thoughts, but he’ll wind up driving the #41 in 2014. And look for Kurt to drive a Ricky Bobby-inspired paint scheme @ ‘Dega…I ‘wonder’ what the car will look like. NASCAR wouldn’t control the 00. I think the 00 is still under the MWR umbrella. I believe David Reutimann drove it during the first couple of years of MWR’s existence. Lot of folks believe that (like in other sports) the drivers keep/own the numbers on the cars they drive, no matter for whom they’re driving. The majority of numbers are owned by the team. It’s at the team’s discretion as to whether or not they will sell/trade/give the numbers to others. Notably, when Michael Waltrip moved on from DEI and wanted to take his #15, Theresa Earnhardt wouldn’t let him take the number. She said at the time that the #15 was important to Dale and the Earnhardt family. When she sold off the team (merged) and was no longer running the show, Mikey was able to secure the number. Clint Bowyer drives the #15 car now. Nice to see some interest in NASCAR on Uni Watch! Interest? I used to have interest. The people running the show are woefully inept. Who owns the NASCAR car numbers? – NASCAR owns and assigns the car numbers and licenses them to teams on an annual basis. – Teams submit to NASCAR requests for car numbers. Depending on availability, that number is issued via an owner’s license, which is good for a year. However, one team can allow another team to use the number with NASCAR approval. – Generally, if a team has used a number, that number is re-issued to the same team. If a team relinquishes a number, it reverts back to NASCAR. Theresa really shouldn’t have been running the show. Thank you, this was an awesome post. The Hale Health patch is one of my favorite uniform details, and it’s cool to see a larger view of the program. I love the thorough historical posts. IIRC, an early version of the San Diego Clippers uniform had the full word “Clippers” spelled out in maritime flags on the sides of the shorts. A nice minimalist logo (three triangular shapes representing sailboats on a sky blue disc with an orange-red sun), a good wordmark, and decent uniforms…should have made the trip up the 5 from San Diego. I remember the logo but not the old uniforms but a quick search and yes they did have the full Clippers back then. Ironic that with larger shorts now you’d think it would go from LAC then to Clippers now instead of the other way around. Until their rebrand I always thought the Columbus Clippers did a good job with a logo. I always wanted to see LA go in a similar route to that. They also wore powder blue. As did the ABA’s L.A. Stars. Every team in baseball should wear this patch for the entire 2014 season. Now if we can only get one for Roger Goodell next. From any distance more than 7 or 8 feet these Virginia Tech helmets look like they’re just some kind of camo. At least GT looks amazing tonight! Makes up for those VT helmets. All GT needs is to put the logo on the helmet and add the names and they should keep that look. They looked much better than what they usually do even with the inconsistent sleeve striping. Wish I caught a screen grab, but why did GT have 2 different sleeve stripe patterns? Most players had Black/Gold/Black. Some had just black over gold. Seriously, though, since the NFL’s Head & Spine whatever panel has made public their finding that it “may be safer” for football players to wear the same helmet all year, (whether or not that is in fact the case) if a college football player wearing an alternate helmet gets injured, couldn’t that be grounds for a lawsuit? Since it’s been made public knowledge that multiple helmets could be unsafe, isn’t the NCAA being negligent in continuing to allow teams to wear multiples? I’m not saying it would be successful, just that someone could argue that. I don’t think there would be a case for a lawsuit. I might be wrong, but I thought the NFL’s rationale that wearing one helmet was ‘safer’ was based off of simply having one helmet you know it fits right. If you switch from one helmet to another to another and back and forth the helmets can’t be fitted properly. If multiple helmets could be fitted properly I don’t think it’s any less safe one helmet fitted properly. I imagine if you compare the Ducks’ concussion numbers to other teams who stick with one helmet you would find the numbers to be identical. Helmet to helmet hits and violent hits involving the head area are what cause concussions. That’s ultimately what causes the injuries, normal hits sustained in different helmets shouldn’t cause issues. In my opinion (which admittedly is not based on any hard numbers), is that the NFL is being overly cautious here.